The Recorded Sound Archives (RSA) is a unit of FAU Libraries Special Collections department. We are located in the Wimberly Library on FAU's Boca Raton campus. Originally established in 2002 as a small project dedicated to the preservation of recorded Jewish music, it has matured into a robust digitization operation for all types of sound recordings. 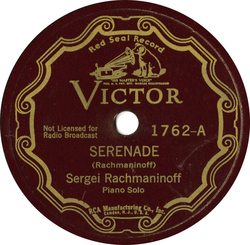 Record Format 78 RPM - 10"
Recordings restricted by copyright will only play 45 seconds to give you a sense of what that recording originally sounded like. These recordings can be identified by the words (Research Station) in the music player. If a song listed below has not been digitized yet, it will NOT show up within the player. If you need us to digitize this song/album, you can make a formal request here.